Boutique luxury cruise line Windstar Cruises, recently named a Top Cruise Line for Couples in the 2016 BRIDES Best Honeymoons Awards as voted by thousands of top Virtuoso travel agents, is making a Tahiti vacation more than a bucket-list proposition. With new lower pricing on select sailings starting at $3,999 per guest including cruise, airfare, and hotel, Windstar offers extraordinary value for those looking to experience romantic paradise in the South Pacific. “Our private yacht style of cruising brings guests closer to the worlds they want to discover, and there’s perhaps no better example of that than on board our elegant sailing yacht MSY Wind Spirit, designed to sail throughout beautiful French Polynesian waters while catering to just 148 pampered guests,” says Joe Duckett, vice president of sales and marketing at Windstar Cruises. When honeymooners, or any couple looking for an escape, think of a romantic destination, Tahiti, Bora Bora, and the islands of Tahiti are at the top of the list. But with costly airfare, expensive lodging, and sky-high food and beverage costs on the islands, few can afford the luxury. 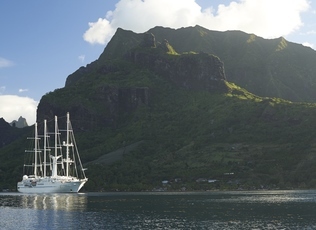 Windstar, however, is making the Tahiti dream trip more attainable, even on a luxury yacht. “The biggest secret about Tahiti is that exploring by yacht is not only the best way to experience the islands, it’s also the best vacation value,” Duckett remarked. With Windstar’s Dreams of Tahiti vacation package, guests experience six islands inclusive of roundtrip flights from Los Angeles, eight night’s accommodations, all ground transfers, gourmet cuisine in multiple dining venues (including 24-hour room service), water sports activities from the sports marina, all non-alcoholic beverages, a champagne welcome reception, and special Private Event in Bora Bora complete with fire dancers and a locally-inspired feast of fresh Tahitian specialties. Comparative costs for similar Pacific island hotel and resort experiences are more than double Windstar’s Dreams of Tahiti experience with the cruise line’s new Cruise + Air + Hotel vacation package. Experiencing the region aboard an elegant sailing yacht provides more opportunity to explore a variety of tropical islands and picturesque lagoons in a relatively short amount of time, without the hassle of local island-hopper flights. Guest enjoy multiple overnights at popular Raiatea and world-renowned Bora Bora, the Polynesian islands are never more than a few hours of scenic sailing away from each other, perfect for a week-long cruise getaway. The cruise vacation package also features both a pre-cruise overnight stay and post-cruise dayroom at the iconic Le Méridien Papeete Hotel. Reached by direct eight-hour flight from Los Angeles, Tahiti is closer and more convenient than guests imagine. For travelers planning an island paradise getaway in 2017, Windstar will offer Thursday cruise departures from Papeete starting in June. New Thursday departures (current sailings leave Fridays) allow more flexibility for air service, with more available flights, departure, and arrival options. Windstar began sailing year-round in Tahiti in summer of 2015 and offers weekly seven-day voyages on the Dreams of Tahiti cruise, as well as several longer 10- and 11-day itineraries that explore both the Tahitian Islands and the remote Tuamotu Islands. The Tuamotus are known as a diver’s and snorkeler’s paradise. The Dreams of Tahiti voyage begins in Papeete and sails to Moorea, Tahaa, Raiatea (overnight), Huahine, and Bora Bora (overnight). In private yacht-style, guests enjoy the aqua blue water of the South Pacific at the stern of Wind Spirit from the yacht’s ingenious water sports marina, which offers kayaks, stand-up paddle boards, flotation devices for relaxing in the water, sailing, water skiing, wakeboarding, and windsurfing — all complimentary. Windstar’s signature dive program offers guests an excellent way to discover the sport, and for certified divers, Windstar’s one- and two-tank dives offer the best in deep-sea sightseeing. Upon boarding the yacht, each guest receives complimentary snorkel equipment for their personal use throughout the journey. Bikes are also available on board for a nominal rental fee. Throughout the voyage Wind Spirit unfurls its computer-operated sails for wind-powered sailing, an exceptionally romantic and unique way to experience the South Pacific seas. The yacht’s well-appointed, nautically-themed staterooms were refurbished in spring of 2015 unveiling romance-inspired design and décor. Wind Spirit’s Dreams of Tahiti yacht vacation package starting at $3,999 per guest includes a 7-day cruise, airfare, and hotel is currently available on more than a dozen sail dates in 2016 with many more 2017 departures being added soon. For additional information, including daily itinerary highlights, special offers, and product information, contact a travel professional or call Windstar Cruises at 1-800-258-7245, or visit http://www.windstarcruises.com. Windstar Cruises operates a six ship fleet of small luxury sail and all-suite yachts visiting 150 ports throughout Northern Europe, the Mediterranean, the Caribbean, Costa Rica, the Panama Canal, and sailing year-round in Tahiti and the South Pacific. The luxury cruise ships are known for an intimate yacht-style experience, unique itineraries and exclusive access to the world’s best small ports and hidden harbors. Windstar’s fleet is the market leader in luxury small ship cruising with a total of 1,242 passenger berths. All ships in the fleet have recently undergone multi-million dollar transformations to embody casually elegant yacht travel. The all suite yachts Star Breeze, Star Legend and Star Pride serve 212 guests in all suite accommodations; while sailing yachts Wind Spirit and Wind Star sail with up to 148 guests, and Wind Surf serves 310 guests. The yachts cruise to 50 nations worldwide. Windstar Cruises is a part of Xanterra Parks & Resorts®, known for “Legendary Hospitality with a Softer Footprint.” Xanterra’s entities also include lodges, restaurants, tours and activities in national and state parks, as well as resorts, railway and tour companies.